If you are interested in learning to quilt but you don’t have much experience with a needle and thread, a beginner class is just right for you. In our beginner quilting classes, Julie covers basic quilting stitches and techniques commonly needed for different types of hand-quilted projects. You'll learn more than you ever thought possible in a beginner quilting class! Ever need a big basket to carry those quilting or paper crafting project flat? A big casserole dish to a picnic? Here it is! Join us for a fun quilt bus tour through 3 shops and enjoy a fantabulous day shopping, eating and having fun without worrying about getting there and back! Join us for a fun quilt bus tour through 3 shops and enjoy a fantabulous day shopping, eating and having fun without worrying about getting there and back! 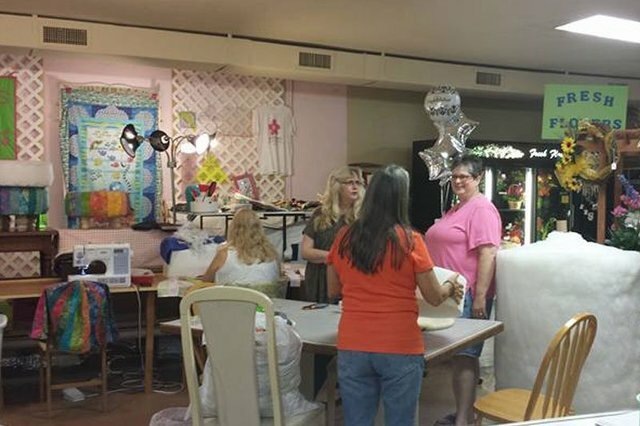 Visit Julie's Pins and Needles in Alachua, FL Miss D's Quilt Shop in Palatka, FL Sew Blessed Quilt Shop and Sew Blessed Sewing Shop in Hahira, Ga.
Sixth Annual ?The Sisterhood of the Traveling Quilts? Bus Tour Registration August 9th and 10th, 2019 7:30 am Arrival Time on Friday, August 9th/ 8:00 am Departure Time Two days of quilt pampering where you will learn new skills, meet new friends, and find great deals, all while visiting 6 wonderful Quilt stores. Each store will have fun demonstrations and specials. Join fellow quilters for a special Central Florida Tour of Favorite Quilt Stores! Registration fee includes your transportation in a luxury coach, hotel accommodations based on double occupancy, and meals (lunch, dinner, and party on Friday / breakfast and lunch on Saturday). Registration Fee Total: $225.00 Deposit of $100.00 will hold your seat. Balance of $125.00 due by July 15, 2019 Single occupancy requires an additional deposit of $55 at registration Cancellations 30-60 days prior to departure will receive a 50% refund. No refund will be given to any cancellations within 30 days prior to the departure date. Please specify your roommate preference (if you have one) in the appropriate space on this registration form. Payment is confirmation of your booking. You must make your payment within one week of your reservation submission. This is only for the additional fee if you are wanting a single hotel room.